Allen and Tetley were sitting quietly in the corner discussing the previous week's walk. "Yes, those rain showers were torrential and Dad got soaked. Thank goodness we huddled down inside the rucksack", replied Tetley. "The amazing thing though, was that when we arrived at the summits it was dry for our picture." "True, but it was typical Borrowdale weather", replied Allen. "When we reached Rosthwaite Fell, it was a cause for celebration for Grizzly and I, as we finally completed all the Wainwright fells in Book 4 - Southern Fells." Just then Shaun and Grizzly strolled in with Little Eric who had hitched a ride on Shaun's back. Shaun said, "the weather forecast is not bad for tomorrow, and Dad has told us we are off for a walk." "To climb High Tove, Armboth Fell and a few other Birkett tops". he replied. "Oh good, that will be a couple more off my Book 3 outstanding list", cheered Allen. Tetley chimed up, "one thing you can be certain about is that it will be a squelch, squelch, squelch all the way along that ridge, as Wainwright says in his chapter on Armboth Fell." "Yes" replied Shaun. "Just what Dad said, when he told us where we were going"
Sunday dawned and we hurried to get ready, and dived into the car when we heard Dad loading his gear. It turned out to be a considerably better day than last week with just an odd shower that did not last very long at all. 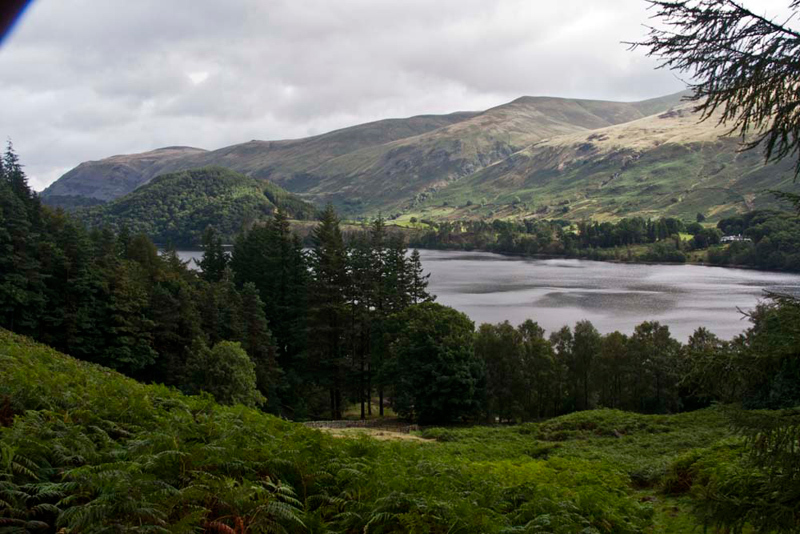 The start point was Armboth car park by the shores of Thirlmere. Dad and Uncle Brian sometimes come here on Boxing Day, as there is a nice view for Uncle Brian, across the lake. 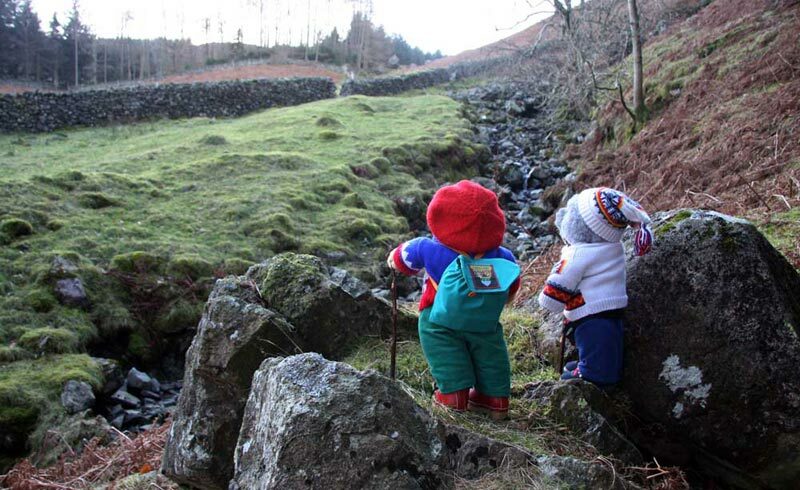 Dad usually goes for a walk, as do our intrepid Lakeland Bears, Ruskin and Langdale. This was indeed to be the case on the forthcoming Boxing Day, and Ruskin and Langdale, have kindly contributed this picture, which indicates our route. Over the rough ground, through the gap in the wall, and along a stoney path, that climbs up beside the trees. Inside these is Fisher Gill, one of the many streams that feed water into the reservoir. "Dad just look at that super view", called out Allen. Turning round, he said "you're right, and it is worth a picture too." The high Fells above the lake are from left to right, Clough Head, the tiny pimple of Calfhow Pike, Great Dodd (summit hidden) and Watson's Dodd. The lower hill covered in trees is Great How, the ascent of which is the subject of another story. At the end of the trees a gap in the cross wall gave access to open fell. It was a steady climb, roughly in a westerly direction for about 3/4 mile, to reach the summit of High Tove, marked by a large cairn. We scrambled up it to have our usual picture taken. and Shivery Knott. Here we are at that summit, with the fells above Borrowdale behind. Then continuing it took about half an hour, to the flat bare rock crossed by the fence marking the top of Watendlath Fell. Lonely Blea Tarn, silver in the light today, was now in view, dominated from behind by Coldbarrow Fell. Yet another story tells of our climb to this and a few other fells on the same day. As you will see this tarn was deep blue on that day. This was the southern most point on our walk today, so turning, Dad now headed north east. Our objective was Armboth Fell, reached after a tramp of around a mile over heathery ground and lots more bog. The summit is a large rocky outcrop with a small cairn. This was the second Wainwright bagged today by Allen and Little Eric, the other being High Tove. The direction was now east towards our last top of the day, Fisher Crag that was soon in plain view, and as we made our way towards it yet more very wet ground had to be negotiated. The route lay over some heathery ground and around the right side of a small tarn. Suddenly, in a loud whisper, Tetley said, "Dad look, there are some red deer over there"
Despite being a little way off, Dad did not waste any time getting the camera out, and snapping them before they disappeared. The dominant back drop is Blencathra with the tree covered Raven Crag in front. Shaun remarked, "that is the first time we have seen deer in this part of the Lake District." Dad walked on towards Fisher Crag. A wire fence was climbed, and then through the perimeter conifer trees to cross the broken stone wall. Just a short ascent followed to the rocky knoll swathed in vegetation that is the summit. There is a large cairn and we immediately jumped out and settled on it for our final picture today. Walking just a few yards further on, we all exclaimed in unison "what a fantastic view of Thirlmere"
"You have got to take that", called out Little Eric. Again Blencathra dominates the background. To the left is Raven Crag and to its right High Rigg, and then further right the tree covered Great How. The high fells to the extreme right are the Dodds. Now all that remained was the return to the car. There was not a clear path, so Dad headed generally north west over the heathery terrain, maintaining height as much as possible. He encountered a few crags but negotiated his way down safely. By keeping high Dad was able to easily cross the main source of Fisher Gill. Continuing with the traverse ,the second source of the gill was then crossed, and the original path regained at the head of the plantation. Now on the outward route we descended to the car park. It had been a good walk, and we have all now bagged these tops. This ridge is extremely wet and boggy and Dad has said that he is unlikely to come to these tops again!